Great Barrington FairgroundsUpcoming Events » » Learn to be a StoryCorps® Facilitator! Learn to be a StoryCorps® Facilitator! If you would like to help with recordings on August 7, 8, and 9 please send us an email! 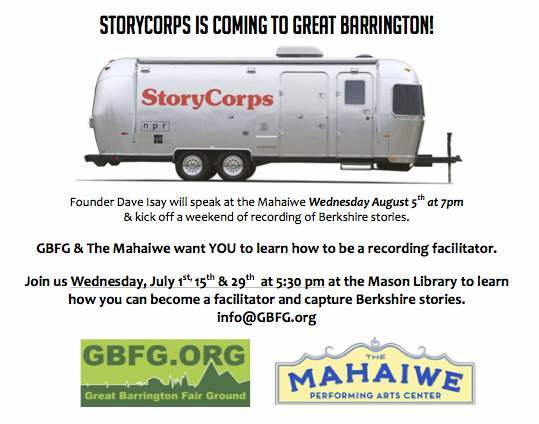 StoryCorps Founder Dave Isay will speak at the Mahaiwe Wednesday August 5th at 7pm to kick off a weekend of recording of Berkshire stories. More information on StoryCorps Founder Dave Isay at the Mahaiwe on August 5th Available HERE!